Save on Residential Plumbing Services! From simple to complex, we can handle all the plumbing repair needs at your Kannapolis home or business. Plumbing Repair in Kannapolis – You may not realize it, but your Kannapolis, North Carolina home’s plumbing system is quite complex. Sometimes when you need plumbing repair, it is pretty evident what the source of the problem is, but that is not always the case. For those situations, you need an experienced and efficient plumbing repair professional. You have found that here at Hall’s Plumbing. We can quickly diagnose any elusive condition, such as what is causing low water pressure or keeping a drain from flowing as quickly as it should. We offer full-service plumbing repair, so you are in capable hands, no matter what comes up with your home’s plumbing. 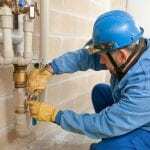 A few of the plumbing repair services we offer are well pump repair, faucet repair, toilet repair, pipe repair, water heater repair, and shower repair. We understand that when something in your home’s plumbing system is not operating as it should, it can derail your day. With our on-time guarantee and reputation for prompt response, you won’t have to experience the long delays you can with other plumbing repair companies. We actually back our guarantee by paying you $5 per minute we’re late for an appointment, up to $300, which goes toward your service or repair. In addition to residential plumbing repair, we also take care of business plumbing repair. We make every effort to reduce the disruption to your business so as to not hurt your productivity and profits. We will work around your schedule as well as arrive promptly in an emergency situation. Whether you need plumbing repair at home or work, think of us first for the high-quality results you deserve. We’ll have an experienced plumber at your property quick to resolve the problem efficiently and effectively. Contact us today for all your plumbing needs in Kannapolis. At Hall’s Plumbing, we offer high-quality plumbing repair services in Mooresville, Iredell County, Kannapolis, Conover, Newton, Mt. Pleasant, Maiden, Taylorsville, Davidson, Sherrills Ford, Denver, Statesville, and Terrell, North Carolina. If you’re wondering, “Where can I find a reliable, professional plumber near me in Mooresville, North Carolina?” reach out to us at Hall’s Plumbing today. What Causes Clogged Drains in Your Home? When Is It Time For a Water Heater Replacement?